Dragonfly Sweetnest: Spring Beauty Must Haves! Lumene’s collection of moisturizing day creams with SPF 15 is a Spring Beauty Must Have! Daily SPF is skin’s best defense against skin cancer and signs of aging like wrinkles and dark spots. Lumene offers complete UVA/UBA protection plus powerful Artic ingredients to make skin luminous this spring. A multi-purpose, SPF-15 infused formula to protect your complexion from sun damage and improve skin’s luminosity. Developed with antioxidant rich Arctic cloudberry seed oil and naturally detoxifying cloudberry nectar, this rich formula fortifies skin against internal and external stressors while removing dulling impurities for improved radiance. Apply to cleansed face every morning. A multi-benefit, anti-aging must-have that works like skincare but acts like lightweight makeup. Finnish beauty brand Lumene is once again breaking new ground in the world of skincare. 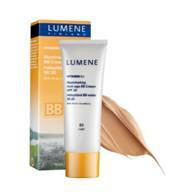 With its Vitamin C+ Illuminating Anti-Age BB Cream with SPF 20, Lumene has taken the beauty balm wonder formulation one step further, enhancing it with anti-aging benefits. Developed with Arctic cloudberry, the key ingredient of Lumene’s Vitamin C+ line, the new Illuminating Anti-Age BB Cream with SPF 20 not only delivers skin-perfecting results, but also delays signs of aging. Combat signs of aging and reduce the depth of already-formed wrinkles with this ultra-conditioning cream. Formulated with Peat Extract to improve skin’s elasticity, and Panthenol and Vitamin E to keep skin soft, supple and moisturized, it helps skin maintain its youthful appearance. Apply to cleansed face and neck every morning. Some really prime blog posts on this internet site, saved to my bookmarks.